Sarony. [Mrs. Scott-Siddons.] ca. 1865. Museum of the City of New York. 63.148.226. 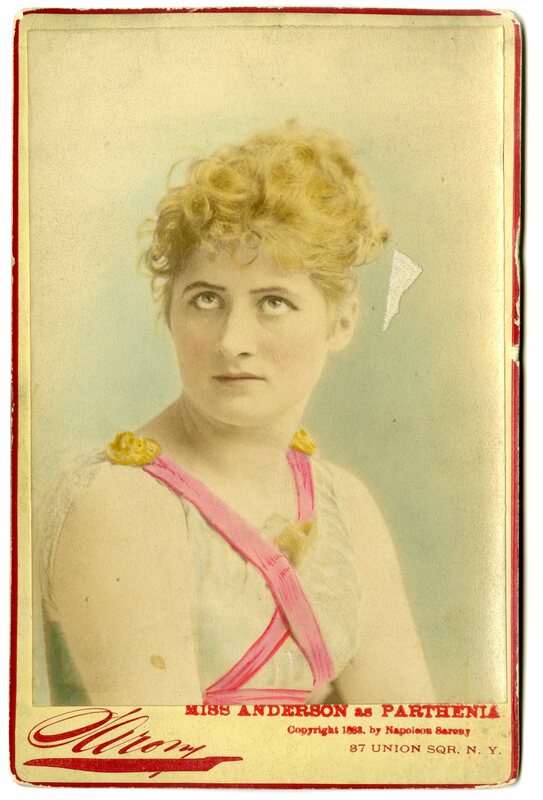 The Museum holds an amazing collection of cabinet cards and carte-de-visites featuring an array of Broadway entertainers, opera singers, and popular personalities (as well as some of their pets), as photographed by major New York photography studios such as Sarony, Mora, Falk, Gurney & Sons, and Fredricks & Co, among others. Measuring roughly 2″ x 3.5″, carte-de-visite portraits became popular in the 1860s as calling cards and collector’s items. 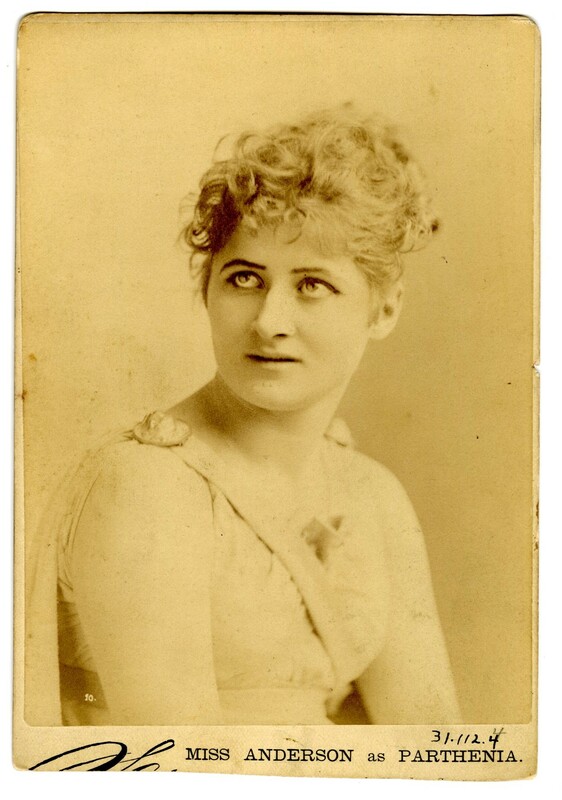 Images of famous performers and personalities were especially in demand, and a popular pastime was assembling albums of beloved actors and singers. 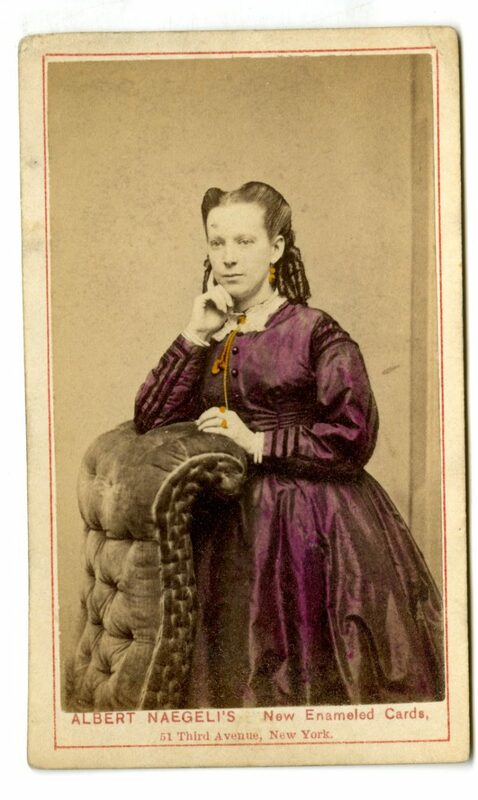 In the 1870s, collecting the larger format cabinet cards (usually around 5″ x 7″) became a trend, one that would continue into the first decade of the 20th century. Performers used these mass produced images to promote themselves and help ensure an audience of adoring fans was waiting in whatever city they performed. Together, these cards provide a broad view of the industry, documenting the stars of the day and showing how the photo compositions evolved over time. This summer, Collections intern Daphne Yuen to immersed herself in this collection, and shares her insights and some of her favorite images in this week’s post. Sarony. [E. A. Sothern]. ca. 1875. Museum of the City of New York. 43.430.877. 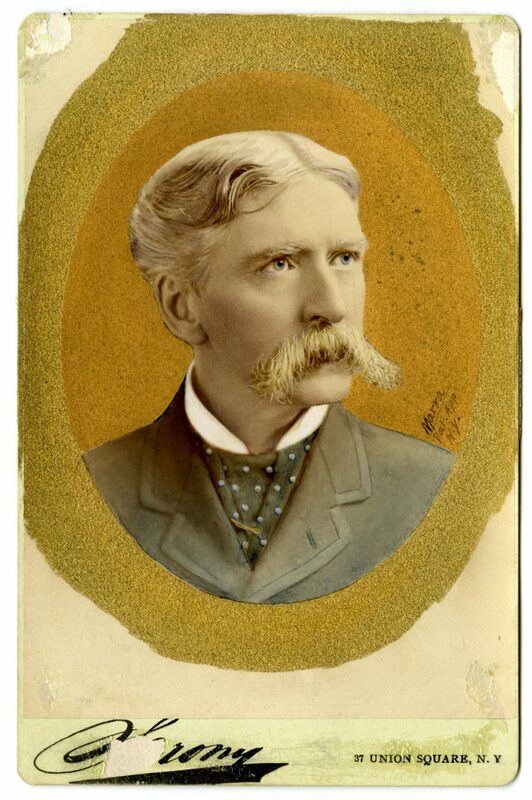 Some of the most intriguing photographs I encountered in the collection of cabinet cards and cartes-de-visites were hand colored, like the gilded portrait of actor E. A. Sothern seen above. Coming across these colored images amongst the seas of monochromatic photographs felt like finding buried treasure. As I examined them, I wondered about the factors that determined which photographs merited the special treatment. Was it influenced by the sitter’s fame or simply a service they had paid for? Sarony. [Mary F. Scott Siddons]. ca. 1870. Museum of the City of New York. 45.320.1. In the early years of photography, hand tinting was commonly used to add value to an image and bring it to life. Cheeks were given a rosy tint and skin shaded to look more natural. 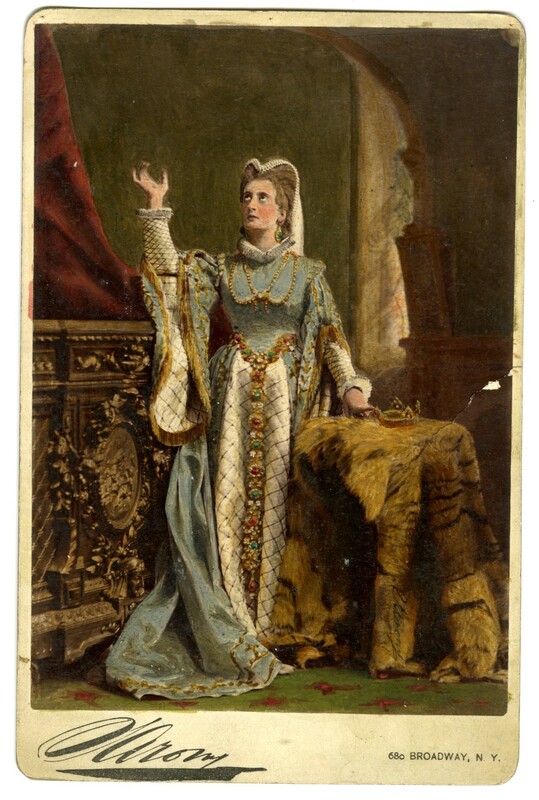 Hand coloring could be used to identify which aspects of the portrait the sitter (or photographer) considered worthy of highlighting, and helped to bring a performer’s vibrancy and extravagantly designed costumes to life. Coloring expertise varied from studio to studio. As one would expect, the higher quality colored photographs generally came from larger and better-known studios. 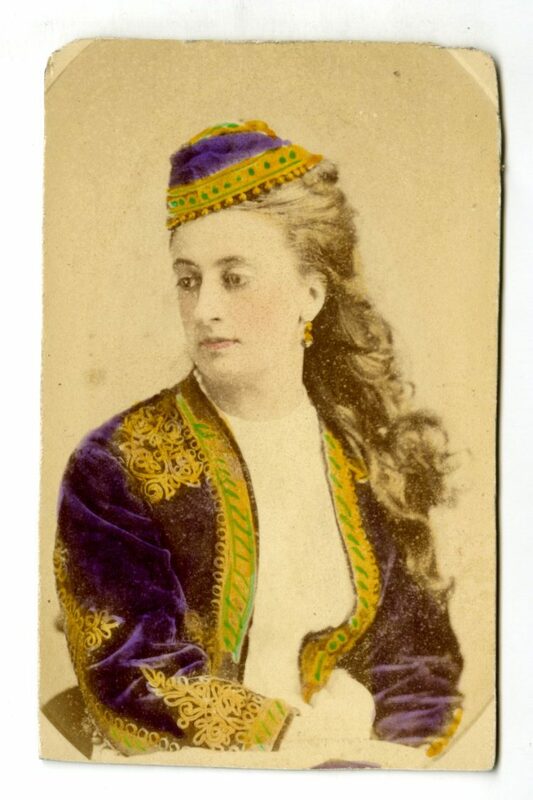 For example, in Sarony’s photograph below featuring Mary Scott-Siddons, each jewel on her dress is given special attention, as is the pattern on the carpet. More famous sitters like Mary Anderson, E. A. Sothern, and Clara Louise Kellogg, to name a few, were more likely to be represented in hand colored photographs. Sarony. 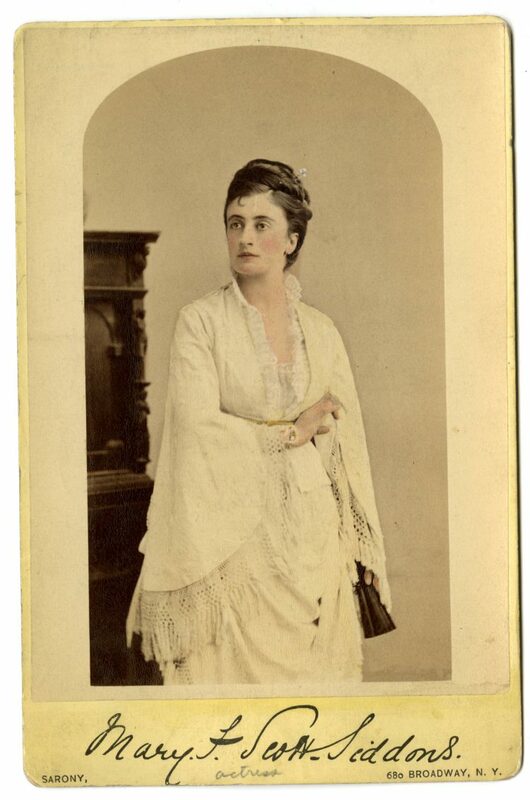 [Mrs. Scott-Siddons]. ca. 1870. Museum of the City of New York. Collection of Cabinet cards. When comparing treated works to their uncolored counterparts, you can see that the realistic quality sometimes diminished with coloring. Rather than bringing it to life, the treatment often made the portrait look more like a painting or a drawing. This effect can be attributed to both the media used to color the photograph, as well as the hand colorist’s talent. 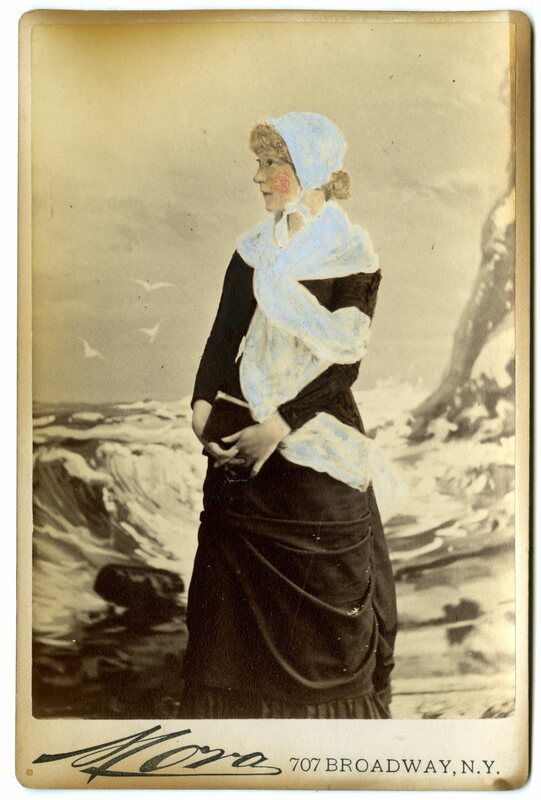 It seemed that the use of watercolor paints were the most successful in giving a portrait a natural and lifelike effect, like the Louise Henderson photograph below. The watercolor gives a more subdued tint of color, unlike a thicker oil paint which could obscure the photographic detail. In the 1860s, however, people developed a taste for the vivid and dramatic color conferred by oil paints, which was popularized in particular portrait studios. For instance, the portrait of Lillian Russell that follows is an excellent example of a successful use of combining watercolor and oil to color a photograph. Her dress is given a subtle light blue tint while a thicker white paint is used to accentuate the texture and depth of her ruffles and pearls. Mora. 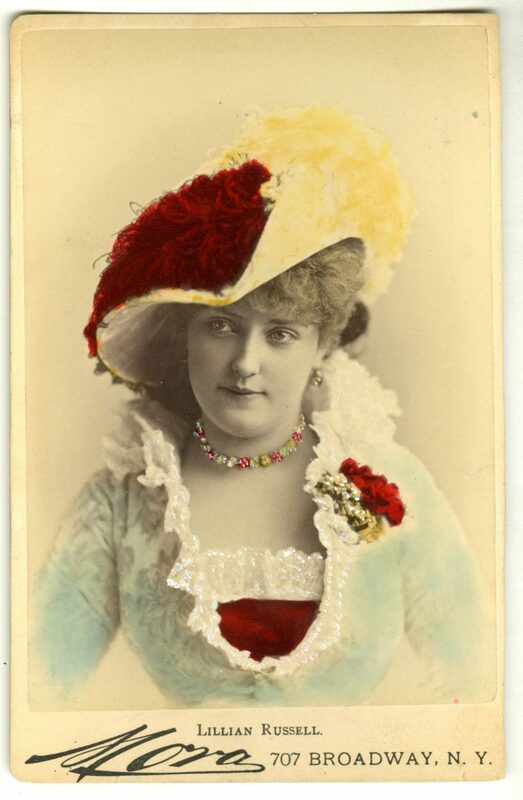 [Lillian Russell]. ca. 1880. Museum of the City of New York. 39.368.87. Unfortunately, the addition of the painted media to photographs increases the potential for deterioration over time. The Clara Louise Kellogg photograph pictured below shows fine cracks in the painted areas, especially in the blue areas of her dress. The photo is now housed in climate controlled storage here at the Museum, but prior to this preservation, it would have been more susceptible to the effects of fluctuations in temperature and humidity. These signs of damage may penetrate below the painted layer and also affect the photographic surface. Sarony. [Clara Louise Kellogg]. ca. 1870. Museum of the City of New York. 53.230.103. 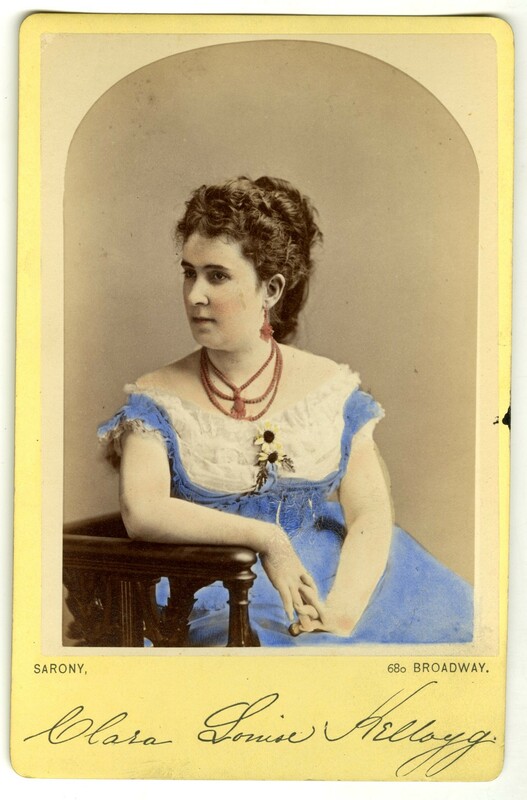 To see more cabinet cards and cartes-de-visites, visit the Museum’s Collections Portal! 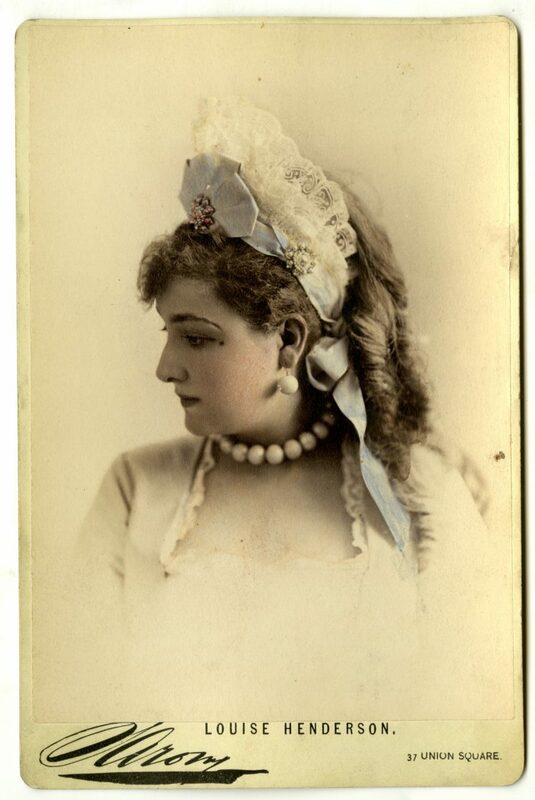 This entry was posted on September 13, 2016 by Morgen Stevens-Garmon in Photography Collection, Theater Collection and tagged 19th century, Actors, Cabinet Card, Carte-de-visites, Jose Maria Mora, Napoleon Sarony, photographs, Photography, Portraits.